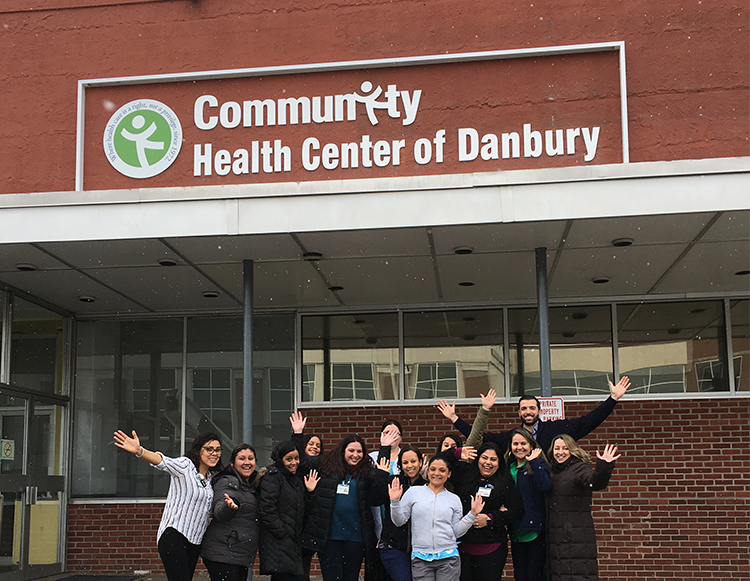 Established in 2008, the Community Health Center of Danbury serves as the healthcare home for residents of Danbury and the surrounding towns of upper Fairfield County. Parking is available in the front parking lot or at Liberty Garage. Please bring your ticket up to the front desk to validate. Larissa Camano Selca, APRN – BSN: University of Washington. MSN: Pace University. Andy Casimir, MD – BA: New York University. MD: Georgetown University School of Medicine. Residency: Johns Hopkins Hospital. Michael Cubria, LCSW – BSW, Lehman College at CUNY. MSW: Fordham Universty. Nnennaya Duke, DO – BSC: College of Health Sciences University. DO: New York Institute of Technology and Osteopathic Medicine. Darius Fathi, PsyD – M – PsyD: Nova Southeastern University. Charles J. Gross, DPM: Scholl College of Podiatric Medicine. BA: SUNY Binghamton. Caroline Kane-Civitano, BS – PA: Springfield College. Kristen Haight, MPH, UMass Amherst. BS, University of Connecticut. Alexsandra Penalbert, LCSW, Springfield College. Erin Poole, LCSW – BA: Quinnipiac University. MSW: Columbia University. Peter Szykowicz, ICCSP: Federation Internationale de Chiropratique du Sport. MS: University of Bridgeport. DACBSP: American Chiropractic Board of Sports Physicians/National Chiropractic College. DC: New York Chiropractic College. BS: Fordham University.